On his knees, Dennis Shore cries out. Acquired: Received a review copy from Hachette Book Group. Reason for Reading: Ever since reading Ted Dekker, I'm wide open to the Christian Fiction/Horror/Thriller genre and this sounded right up my alley. Dennis Shore has enjoyed a successful career as a horror writer but now, a widower, with his daughter off to college he is suffering a terrible case of writer's block and can't start his next book. In the meantime, his latest book has just hit the shelves and is as popular as ever. This is when he starts receiving e-mails from a crazed fan accusing him of plagiarizing that book from him. The emails turn into text messages and phone calls. Then parcels start arriving and other more threatening events happen as he meets his accuser, who just happens to really be the true author of Shore's latest bestseller. Dennis's imaginary world of horror is turning into a real life horror story. This wasn't bad, not great, but okay. The Christian fiction angle of it is really not a big deal within the story and is stuck into the climax and denouement of the book's plot. This, I guess, is a way to appeal to both mainstream and Christian audiences but it feels forced, stuck on at the end. I'm a Christian reader of the book but I found myself shaking my head at the corny conversion. That aside, the horror story was quite well-written. An interesting and creepy story that is hard to make sense of at first. The reader is as confused as the main character wondering whether he is being stalked by a madman, visited by the supernatural, loosing his mind or a combination of all three. There are some fairly gruesome bits not for the faint of heart. The writing style does leave a lot to the imagination but enough details are given that you know exactly what happened and of course, being CF, there is no cursing. 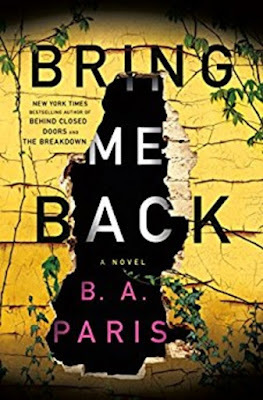 A decent horror story that I certainly enjoyed enough to have read the whole thing, but it feels as if the book is trying too hard to be Christian fiction that can crossover into mainstream fiction, and not quite succeeding. Thrasher has written several other books in this genre, though, and I'm willing to give him another try. Sounds very interesting. I like when a character's faith is organic to the story, not when it's tacked on in some way. A lot of Christian writers are getting better at making it seem very natural. I even read a conversion scene recently (and actually, conversion scenes are now rare even in Christian fiction) that was quite natural and even beautiful.